Definition at line 38 of file CCopasiSpringLayout.h. Definition at line 48 of file CCopasiSpringLayout.h. References defaultValues, isLog, max, min, names, and values. Definition at line 106 of file CCopasiSpringLayout.h. Definition at line 43 of file CCopasiSpringLayout.h. Referenced by applyDefaults(), and Parameters(). Definition at line 46 of file CCopasiSpringLayout.h. Referenced by CQSpringLayoutParameterWindow::CQSpringLayoutParameterWindow(), Parameters(), and CQSpringLayoutParameterWindow::slotLayoutSliderChanged(). Definition at line 45 of file CCopasiSpringLayout.h. Referenced by CQSpringLayoutParameterWindow::CQSpringLayoutParameterWindow(), and Parameters(). Definition at line 44 of file CCopasiSpringLayout.h. Definition at line 41 of file CCopasiSpringLayout.h. Definition at line 42 of file CCopasiSpringLayout.h. 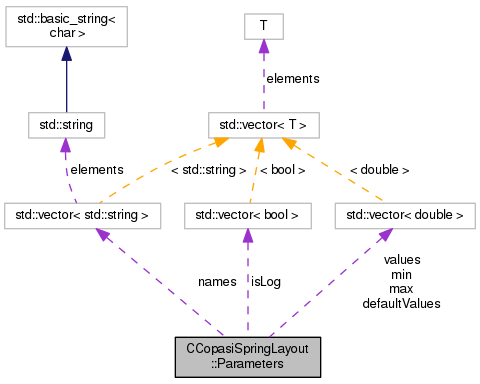 Referenced by applyDefaults(), CQSpringLayoutParameterWindow::CQSpringLayoutParameterWindow(), CCopasiSpringLayout::getPotential(), Parameters(), CCopasiSpringLayout::potEdge(), and CQSpringLayoutParameterWindow::slotLayoutSliderChanged().